Prayer chapels: How much do you need one? You may not know it, but you really need a prayer chapel. When was the last time you found a place where just stepping inside for a moment calmed you and centered you and helped you feel that God was there? 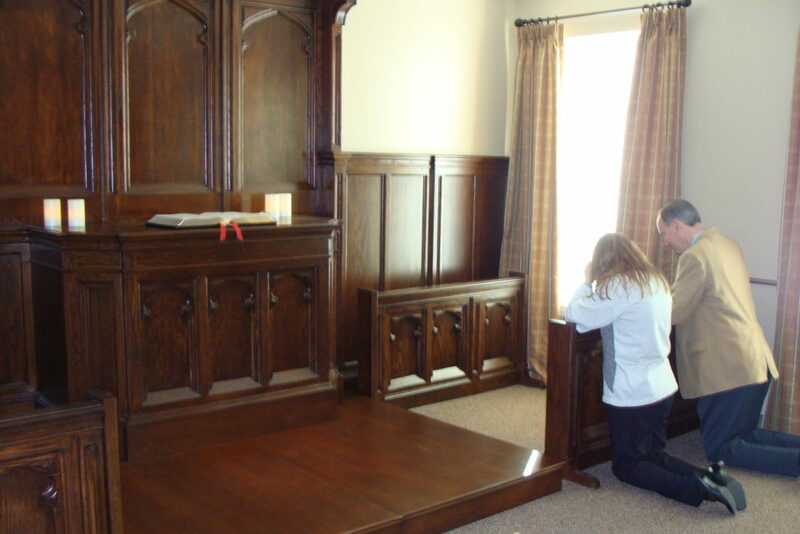 A few years back our church completed a building renovation that included the creation of a small prayer chapel in a former Sunday School room. We’ve never had a prayer chapel before, but with more and more activities going on at the church, it became harder to find a quiet place to pray and meditate. We had an Open House for the congregation to see all of the great new changes at our church and I was stationed in the prayer chapel for an hour to welcome visitors and to tell them a little bit about the prayer chapel. Those who came to visit, especially long time members, were very touched and grateful that the altar, altar rails and woodwork from our former small sanctuary built in 1938 had been lovingly restored and installed in the prayer chapel. I invited people to come up and touch the vintage woodwork and to think about all of the people who had knelt there over the years for communion, confirmation, prayer, and salvation. How many baptisms, funerals and weddings had taken place in front of the altar? Just putting my hand on the old altar rail made me feel connected with a long and wonderful history of faith and I even felt a little teary-eyed. They continued on down the hall to the service and I went back into the prayer chapel, knowing that it would be a place where many could pause amidst the stress and hurry of life and spend a moment simply enjoying God’s amazing presence. Visit a special place of prayer this week. God will always meet you there.